Born on 17-10-1971 at KG hospital in Chennai, Deepak Kidambi Parthasarathy, affectionately known as Deepu, did his primary schooling at Baba School Kodambakkam and completed his secondary and higher secondary education from Ramakrishna School (North), T. Nagar. He did his B.Com at Loyola College in Chennai before becoming a Chartered Accountant. He had his CA Articleship under Mr. Subramanium and Mr. Madhavan of Ford Rhodes Parks & Company. Deepu worked in Madras Cements, Chennai for nearly 2 years, during which he toured many places in South India. He then joined Gulf Tech India Ltd in Bangalore. From this company, he had a chance to go to Riyadh and Jeddah twice. 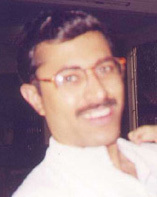 He then joined Alessa Hameed A Alessa & Sons Co, Saudi Arabia, which was a client of Gulf Tech. He got an excellent job in US with UBICS which he was supposed to join after returning to India from Dubai. But fate took him and Sriram to Dubai, where both of them died in a bus accident on 28th October 1999. Deepu had a very versatile character and was liked by everybody, He never lost his temper and always made the environment very lively. He was very helpful and generous. Favorite colour- Maroon and all bright colours, T-shirts with white base and Green plants. Favourite stars- Kamal Hasan, Sridevi, Yuvaraani, M.R.Radha, N.S.Krishnan, Kaundamani-Senthil comedy. Favourite Clothes- T-shirts, Jeans, shorts. Happy when dressed up formally. Favourite songs- Raja raja cholan naan (from the film 'Rettai vaal kuruvi') , Ooru sanam thoongidichi ( from 'Amman kovil kezhakaale') , Megam kottattum ( from 'Enakkul oruvan') , all MGR songs using drum beats, all hits of Ilayaraaja. Favourite singer- S.P.Balasubramaniam and Janaki. Favourite places- Home in Kodambakkam and Grandparents' house in Tiruvanmiyur. Wanted to visit Egypt, US and snow & hilly areas. Favourite ad- The Ad for Pepsodent (starring Ruby Bhatia) where a small kid says 'off-white' when the question was asked about colour. Favourite animal- Loved all animals. His favorite pet was a cat called Gundu(Fatty), which was as lazy as him. Deepu and Shoba used to have a friendly fight with their grandmother since her pet was another cat called olli(Thin). Favourite food Items- His mother's and Grandmother's cooking, Stuffed Brinjal, Tomato soup, Poondu rasam, and all channa varieties for chapathi and poori, Vegetable Bonda, vatha kozhambu, MOR kozhambu, Appalam, potato and Chepankizhangu roast, Aavakkai. He also liked peranda thogayal and dhevasa saapaadu. Liked to irritate his mother and sister by saying that he was going to take off his moustache. Enjoyed when somebody helped him in applying oil to his head. He used to apply oil to his legs and moustache himself daily. Liked to take bath in very hot water. Was very curious about the universe and planets and was happy (even proud) about knowing a lot about them. Liked to discuss Bhagwad Geetha and about historic facts and general topics with his father. Hated to study for examinations, but concentrated a lot when he read storybooks. Compiled with the help of Shoba, Deepu's sister.